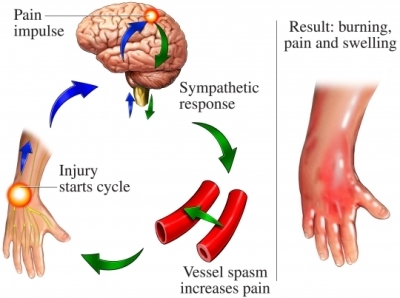 Complex regional pain syndrome (CRPS). EBSCO DynaMed Plus website. Available at: https://www.dynamed.com/topics/dmp~AN~T114998/Complex-regional-pain-syndrome-CRPS . Updated December 1, 2017. Accessed August 23, 2018. 8/10/2007 DynaMed Plus Systematic Literature Surveillance https://www.dynamed.com/topics/dmp~AN~T114998/Complex-regional-pain-syndrome-CRPS : Zollinger PE, Tuinebreijer WE, Breederveld RS, Kreis RW. Can vitamin C prevent complex regional pain syndrome in patients with wrist fractures? A randomized, controlled, multicenter dose-response study. J Bone Joint Surg Am. 2007;89:1424-1431. 11/9/2009 DynaMed Plus Systematic Literature Surveillance https://www.dynamed.com/topics/dmp~AN~T114998/Complex-regional-pain-syndrome-CRPS : Cacchio A, DeBlasis, E, Necozione S, di Orio F, Santilla V. Mirror therapy for chronic complex regional pain syndrome type 1 and stroke. N Engl J Med. 2009;361(6):634-636. 4/24/2014 DynaMed Plus Systematic Literature Surveillance https://www.dynamed.com/topics/dmp~AN~T114998/Complex-regional-pain-syndrome-CRPS : Wise JN, Weissman BN, et al. American College of Radiology (ACR) Appropriateness Criteria for chronic foot pain. Available at: https://acsearch.acr.org/docs/69424/Narrative. Updated 2013.